Fishing inshore this week we can expect to catch plenty of snook & jack crevalles. Live baiting around structure close to shore will give you great odds at many snook & jacks through out the entire day. Moving tides will greatly increase the number of bites when live bait fishing for snook or jacks. Expect a few tarpon to be around in deeper channels bends, inlets, etc. Large mullet or crabs is a sure fire way to catch tarpon during april. Few snappers are being caught locally inshore but most are small, as we get closer to summer we can expect them to reach a larger size better suited for the dinner table. Bottom fishing with shrimp still remains strong with lots of action from sheepshead, snapper, tripletail, flounder, snook, croaker, redfish, & black drum. Cobia is our main focus this week. clients are catching 2-3 a trip on average during the month of April. fish are generally 20-30 lbs. but expect a few 50lbs or bigger during the spring run. Live bait fishing or sight casting with jigs is an excellent way to target cobia with great success. If your not sure the cobia is leagal size,(33″ to the fork of tail) then use a landing net to ensure a safe release if not legal size. Snapper fishing has been steady over the past few trips with lots of nice lanes, mangroves, & mutton snapper being caught regularly when bottom fishing nearshore reefs & wrecks. Kingfish & bonita are very active lately so soak a surface bait with wire for kings or a circle hook rig with mono leader for bonita & cobia. Fishing offshore in April can be very hit or miss when trolling. With that being said, I always have some cut bait or vertical jigs as a back up if the trolling just isn’t happening. 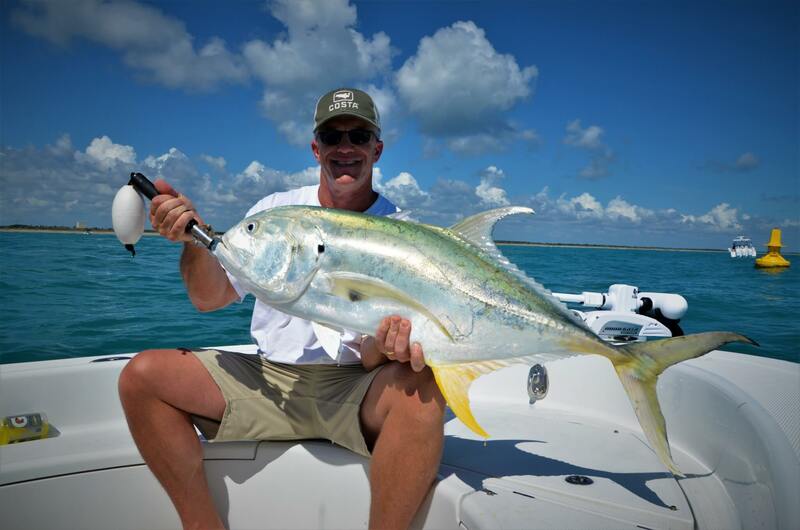 If the trolling is hot expect good action from Mahi as we typically get a good migration of them during April & May. A few wahoos are being caught high speed trolling around push button hill. Vertical jigging around push button hill will also produce nice blackfin tuna this time of year when the conditions are right. Also, kingfishing with planners & wire rig ballyhoo is an excellent idea if the surface trolling bite looks bleak. Bottom fishing deeper wrecks & reefs will produce good numbers of amberjacks, grouper, & cobia this time of year so make sure your tackle is adequate size.